» How much energy is released in ATP hydrolysis? ATP is often referred to as the energy currency of the cell. Hundreds of reactions in the cell from metabolic transformations to signaling events are coupled to the hydrolysis (literally meaning “water loosening”) of ATP by water . The reaction ATP + H2O <—-> ADP + Pi transforms adenosine triphosphate (ATP) into adenosine diphosphate (ADP) and inorganic phosphate (Pi). The free energy change associated with this reaction drives a large fraction of cellular reactions with the membrane potential and reducing power being the other two dominant energy sources. But exactly how much is this energy currency worth and what does it reveal about the chemical transactions that can be purchased? Of course, there is no one answer to this question since the amount of energy liberated by this hydrolysis reaction depends upon the intracellular conditions, but it is possible to get a feeling for the approximate “value” of this currency by resorting to some simple estimates. Figure 1: The relation of the Gibbs free energy of ATP hydrolysis under standard conditions to the equilibrium constant, and the relation of the free energy of hydrolysis under physiological conditions to the physiological reactants concentrations. The Gibbs free energy change (ΔG) due to ATP hydrolysis depends upon the concentrations of the various participants in the reaction as depicted in Figure 1. When the concentrations are farther from their equilibrium values, the absolute value of ΔG is greater. Under “standard” conditions (i.e. concentrations of 1M for all reactants except water which is taken at its characteristic concentration of 55M) the Gibbs free energy of ATP hydrolysis varies from -28 to -34 kJ/mol (i.e. ≈12 kBT, BNID 101989) depending on the concentration of the cation Mg2+. The dependence on Mg ions occurs because the positively-charged magnesium ions help to stabilize the ATP molecule. However, in the cell the conditions are never even close to the standard state values. For example, a concentration of 1M ATP would mean that the mass of solute would be similar to that of the water solvent itself. In figure 1 we show the often confusing derivation of the physiological free energy (ΔG) given the ratio of concentrations from the standard value (ΔGo). The division by terms such as [1M] are required in order to take care of units as a logarithm should always contain a unitless term. It is sometimes surprising to think that if the cell was at equilibrium, the value of ΔG would have been zero, and there would be no energy to gain by ATP hydrolysis. Fortunately, this is never the case in living organisms. .
Table 1: Free energy for ATP hydrolysis in various organisms and under different physiological conditions. Inferred ΔG’ calculations based on a value of ΔG’0 of -37.6 kJ/mol. This makes the table values consistent among themselves but creates small deviations from the ΔG’ values reported in the primary sources. Such deviations can result from variations in ionic strength, pH and measurement methods biases. Values are rounded to one or two significant digits. In spinach, where Pi concentration was not reported, a characteristic value of 10 mM was used (BNID 103984, 103983, 111358, 105540). In practice the physiological conditions depend on the organism being studied, the tissue or compartment within the cell under consideration, and on the current energy demands for metabolic and other reactions. For example, in perfused rat liver the ATP to ADP ratio was found to be about 10:1 in the cytosol but 1:10 in the mitochondria under high rates of glycolysis, and under low rates of glycolysis both ratios were much close to 1 (BNID 111357). Therefore a range of values for ΔG is expected. The key to understanding this range is to get a sense of how much Q differs from K, i.e. how the concentrations differ from standard conditions. 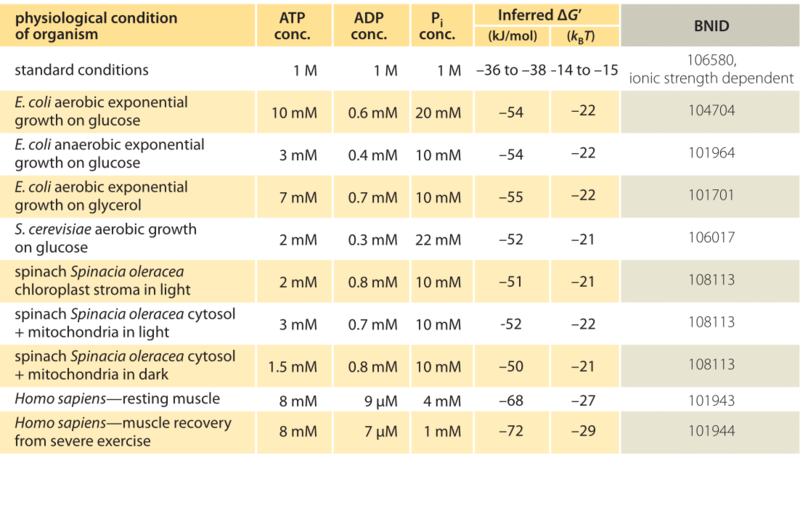 The typical intracellular concentrations of all the relevant components (ATP, ADP and Pi) are in the mM range, much lower than standard conditions. The ratio [ADP][Pi]/[ATP] with concentrations in the mM range is much lower than one, and the reaction will be energetically more favorable than at standard conditions as shown in Table 1. The highest value ≈-70 kJ/mol (≈30kBT) was calculated from values in the human muscle of athletes recovering following exertion (BNID 101944). In E. coli cells growing on glucose, a value of -47 kJ/mol was reported (≈20kBT, BNID 101964). To put these numbers in perspective, a molecular motor that exerts a force of roughly 5 pN (BNID 101832) over a 10 nm (BNID 101857) step size does work of order 50 pN nm, requiring slightly more than 10 kBT of energy, well within the range of what a single ATP can deliver. The calculations of ΔG require an accurate measurement of the relevant intracellular concentrations. Such concentrations are measured in vivo in humans by using nuclear magnetic resonance. The natural form of phosphorus (31P) has magnetic properties, so there is no need to add any external substance. The tissue of interest such as muscle is placed in a strong magnetic field and shifts in frequency of radio pulses are used to infer concentration of ATP and Pi directly from the peaks in the NMR spectra. In E. coli, the concentrations of ATP can be measured more directly with an ATP bioluminescence assay. A sample of growing bacteria removed from the culture can be assayed using luciferase, a protein from bacteria that live in symbiosis with squids but that has by now joined the toolbox of biologists as a molecular reporter. The luciferase enzyme uses ATP in a reaction that produces light that can be measured using a luminometer, and the ATP concentration can be inferred from the signal strength. So we have cell content as an input, luciferase as a “device” that transforms the amount of ATP into light emission that serves as the measured output. Using tools such as these one finds that in “real life” ATP is worth about twice as much as under “standard” conditions because of the concentrations being more favorable for the forward reaction. We finish by noting that it is a standing question as to why the adenine nucleotide was singled out to serve as the main energy currency with GTP and the other nucleotides serving much more minor roles. Is it a case of random choice that later became “frozen accident” or was there a selective advantage to ATP over GTP, CTP, UTP and TTP?